I read a quote today that made me think about my summer professional development. Nataf Emmanuel wrote, “Education used to be simple: there was a blackboard, a teacher, and desks in a classroom. Today, a student can practice English online, upload homework through a portal and learn chemistry through 3D immersion — such is the rise of educational technologies” (2018, para. 1). It is true. I can’t keep up with educational technology. But I certainly try. Technology is ever-evolving, and that is one of the things on my list to study during the summer. I am going to try out a couple of new things so that I can share them with my classes. After all, our current AASL Standards note that “Educational leaders and policymakers should strive to provide sufficient access to up-to-date, robust technology and connectivity. An effective school library plays a crucial role in bridging digital and socioeconomical divides” (2018, p. 14). I wholeheartedly agree. It is not a secret that I believe that school librarians should be leaders in their schools, and one way to lead is to share technology. While your school may have a technology specialist, you can still work collaboratively with them to provide professional development and teach students. I also believe that we don’t need to know everything about technology. We need to know the basics and a couple of tricks. In other words, we need to understand a couple of things that can help our school communities. Technology that is important for one school may be irrelevant to another. A question that I often get is, “Where should I look to learn about new technology?” Of course, AASL has the Best Websites for Teaching & Learning and the Best Apps for Teaching and Learning resources. They are updated each year and contain a wealth of information. 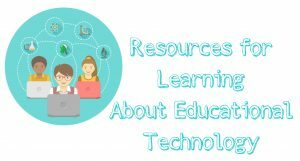 I am also sharing a list of websites and blogs related to educational technology. Occasionally reading them can help you get acquainted with new technology so that you can put some tricks in your bag for the next school year. Please note that I have not read all of the content on these blogs. In addition, I know that there are other blogs to read. This list is not all-inclusive. If you have a website or blog that you like, please share. American Association of School Librarians. (2018). National school library standards for learners, school librarians, and school libraries. Chicago, IL. ALA Editions. Note: The photo in this post was purchased from DepositPhotos.com. 11:00 AM – 11:30 AM EST Google Classroom: Setting Up, Organizing, Archiving, and More! I use Kasey Bell at Shake Up Learning all the time. (https://shakeuplearning.com/) We are a Google school, and her blog and website containseverything Google – great tips, tricks, downloads, podcasts, certification classes, and more.